From the spring 1951 issue of The Vegan (volume 7 number 1 pages 2-3). Available as PDF. Learn more about Leslie Cross and the history of veganism. Enclosed with each copy of this issue of The Vegan sent to members is a copy of the new rules, with a form to be filled in and posted to the new Secretary, Mrs. Hilda Honeysett, 38 Stane Way, Ewell, Surrey. This article is intended to explain the more important points about the new rules which The Vegan Society adopted at a Special General Meeting in London on November 11th, 1950. We have to remember that when the Society was founded in 1944 there were no rules, and that this position remained until March 1947, when rules were adopted which have served until now. 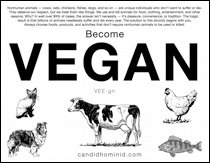 For some time, however, it has been apparent that as veganism developed, the first set of rules became less capable of providing the Society with a wise and logical constitution. The great difference between the old and the new rules is that this inability has been made good. Our rules are not mere regulations, nor are they simply an outline of our working arrangements. Of course, they are regulations, and they do describe the kind of machinery we have agreed upon, but they do much more — they enshrine and safeguard our ideals. They state precisely, and with the corporate authority of the Society behind them, the ultimate goal to which we aspire. Lack of such a statement was the most serious deficiency of the earlier rules; though it has to be remembered that when they were adopted the Society had not evolved to the point at which we could agree upon our ultimate aim. By stating our agreed goal, and by defining the word "veganism" officially, we have found a permanent common, and brought to an end the dangerous and ever-present possibility of disintegration. The object of the Vegan Movement ("to end the exploitation of animals by man") is clarified as to the meaning of exploitation by Rule 4 (a), which pledges the Society to "seek to end the use of animals by man for food, commodities, work, hunting, vivisection, and all other uses involving exploitation of animal life by man." By the adoption of this rule, the Society has clearly come out on the side of the liberators; it is not so much welfare that we seek, as freedom. Our aim is not to make the present relationship between man and animal (which if honestly viewed is mostly one of master and slave) more tolerable, but to abolish it and replace it by something more worthy of man's high estate. In short, our aim is to set the creatures free — to return them to the balance and sanity of nature, which is their rightful place, and so to end the historic wrong perpetrated when man first decided he had the right to exploit and enslave them. The second broad aspect of the vegan aim is its effect upon human evolution. Apart from the abolition of an enormous burden of cruelty which is bound constantly to return like a boomerang upon humanity's own head, it has to be remembered that in any relationship of master and slave, the greatest and deepest harm is suffered not by the slave, but by the master. Until the present relationship between man and his fellow creatures is replaced by one of companionship on a relatively equal footing, the pursuit of happiness by man is foredoomed to a painful and tragic frustration. These are the broadest effects of the new constitution, but there are other aspects which should perhaps be touched upon. It is now possible to join the Society either as a full member or as an associate, and the Committee asks each existing member to state in which category he or she wishes to be. It may therefore be helpful to point out that the new rules define a member as one who undertakes to live out vegan principles as far as he or she is able according to circumstances. In other words what is required is one's honest best; and honest in this context means reasonable also. No one should deny themselves the benefits of full membership simply because circumstances preclude as great a degree of consistency as might otherwise be desired. The great thing is to be vegan in spirit, and then to do one's best. An associate is one who is with us in principle, but who wishes to give no kind of undertaking as to practice. The line of demarcation is, therefore, not rigid consistency, but endeavor. The annual subscription has been raised to 7s. 6d. and life membership to 7 guineas. The Committee has decided that the annual subscription shall in future cover the period January 1st to December 31st, and shall become payable on January 1st each year. One other important operation performed by the new rules is an increase in the unity of the Movement by making it possible for the London Vegan Group to end its separate existence and become a branch of the Society. Constitutionally, the London Vegan Group is older that The Vegan Society, and is an organisation in its own right. By allowing for the setting up of branches of the Society, the new rules clear the way for the London Vegan Group to integrate itself into a united movement. It is perhaps not too much to claim for the new constitution that it marks the true birth of The Vegan Society. It should be read and understood by all who contemplate joining us, for there, enshrined and embedded in words which are necessarily formal, lies all that we stand for and hope, one glorious day, to achieve.